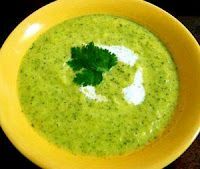 This easy-cooking Broccoli soup is full of nutrition. It provides you with Vitamin A (Beta-Carotene), Vitamin K, Folic Acid, Calcium and Fibre. Broccoli has the ability to control high-blood pressure and has also been quoted to prevent colon cancer. Recent research discovered that the vegetable helps with the detoxification process due to its content of Glucoraphanin, Gluconasturian and Glucobrassicin. All these are useful in helping the activation, elimination and neutralisation of unwanted contaminants. Naturopaths also propose that Broccoli helps prevent heart diseases and cataracts. Those who suffer from acute or chronic constipation will also find Broccoli as an ideal dish as it is rich in fibre. 1) Prepare a pot with water. Throw in the Celery, Potatoes, Carrot, Garlic and Onion to boil for 15 minutes. 2) In a separate pot, boil the Broccoli for 3 minutes. Then, drain the water. 3) Blend contents from both pots. 4) Then pour the blended mixture into a pot and put to boil on slow fire for 2 minutes. 5) You may then choose to add in the sour cream (optional) and salt. Stir until the mixture comes to boil. 6) Serve in a bowl garnished with coriander. It’s simple, yet nutritiously delicious! Try it! What are the symptoms of stomach cancer, and how extreme are they?